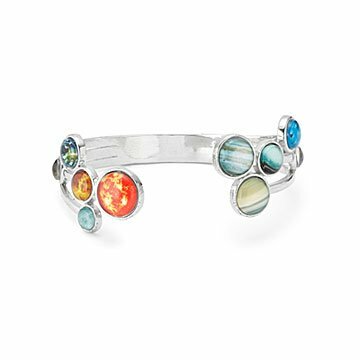 This bracelet is a wearable tribute to the Sun and nine planets in our solar system. Inspired by our place in the cosmos and the "local color" of our galactic neighborhood, fine art photographer turned jewelry designer Lauren Beacham created this wearable tribute to the Sun and its nine planets. That's right-- Pluto's still in the line-up, along with the other eight planets of our solar system, each represented by a digital image of the real thing set on a silver-toned cuff bracelet. Handmade in Maryland. Make it a set! Click here to see the matching Solar System Mismatched Earrings and Solar System Bubble Bib Necklace. Item is not waterproof - please avoid getting wet. While bracelet is adjustable, it should not be bent frequently. I have gotten nothing but compliments when I wear it - everyone says it is so unique...expect more orders (lol). Beautiful bracelet. I also bought the matching necklace. Awesome addition to this set! This was a great gift that my wife absolutely loves. It is an addition to the necklace I purchased prior. My daughter is a space buff and she was delighted to receive this bracelet as a Christmas gift. After wearing it only 2 or three times, the metal holding the planet gems together broke away. A cuff-style bracelet has to be able to withstand the metal bending slightly to slide the cuff on and off the wrist, but the connections between the planets are very soft and snapped easily. I received this for my birthday along with the matching solar system necklace - such a wonderful surprise. This is something I will always treasure. Quality craftsmanship, great NASA shots. I noticed some reviewers wanted something telling which planet is which - I received a card with both pieces of jewelry showing the planets lined up from inner planets, sun and outer planets. Couldn't be clearer. Next are her earrings and a ring. Thank you Lauren!